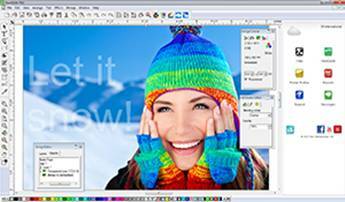 SA International (SAi), the leading provider of solutions for the professional signmaking, wide-format digital printing and CAD/CAM for CNC machining industries, has extended two of its most popular software packages to include useful web-based tools that enhance the way sign and print providers do business. SAi Flexi Cloud and SAi PhotoPRINT Cloud bring state-of-the-art, Internet-based capability to SAi’s best-known brands, while adding many useful functions. SAi Flexi Cloud adds a new dimension to the feature-rich attributes of SAi’s leading sign making software, Flexi, which provides easy text layout and vinyl cutting packages that offer high production capabilities with cutting and printing tools. In addition, the new SAi PhotoPRINT Cloud increases the functionality of SAi’s PhotoPRINT RIP software, which offers an affordable, easy-to-use print-and-cut solution for wide-format print businesses. Local and remote production information through Job Reports – a valuable feature that offers an easy way for business owners to view production information and trends. The Job Reports tool provides summary production information on completed projects, providing critical analytics on print-and-cut jobs, printer and media usage, as well as total production time on each job. Cloud Storage – an on-line data hosting facility that provides sign and print businesses with 1GB of free storage for uploading and archiving design jobs for backup, sharing and retrieval as required. Accessible via an icon within the Cloud Web Window, this convenient feature also provides the platform architecture needed for future cloud-based business growth capabilities. FlexiQuote™ – an innovative web-based tool that allows sign and print businesses to quickly and effectively create customer quotes for new jobs. FlexiQuote features a simple, user-friendly design, which comes pre-loaded with a database of standard media and their costs to rapidly and accurately configure pricing, while factoring in materials, labor, commissions, discounts and taxes. As such, the handy FlexiQuote ‘wizard’ overcomes the occasionally troublesome and time-consuming job quoting process faced by sign and print providers, and can give a customer quote within 30 seconds. In addition to Job Reports being viewable through the Cloud Web Window within SAi’s Flexi Cloud and PhotoPRINT Cloud solutions, SAi has created a free, companion mobile application that also provides businesses owners with remote access to valuable production information while on the road or away from the office. Known as the SAi Cloud mobile app, SAi is the first RIP manufacturer to offer such a mobile application, which is compatible with both Android and iPhone devices. SAi’s Cloud Web Window also provides useful links to a growing number of other resources and content. These include media profiles, software updates, support information, and SAi’s dedicated social media channels, which feature informative training materials and videos. “Our customers know us for simplifying and improving the way they do business, so we are delighted to once again lead the way when it comes to delivering innovative tools that meet these objectives,” says Dean Derhak, Product Director at SAi. “Providing vital, instantaneous information, whether in the office or on the go, SAi Flexi Cloud and SAi PhotoPRINT Cloud reflect the fast-pace at which business owners operate today. “The result is design-through-production software that enhances efficiency and builds on the heritage of our best-known brands to deliver information to users, wherever they’re working,” concludes Derhak.